Note: For this recipe, the ideal minimum is three layers of phyllo pieces for the bottom and three for the top, and 1/2 cup (8 tablespoons) of cheese filling; however, it can be made with more of both (or less filling, if using a smaller baking dish). The common name of this recipe is patsavoura, which means "rag" and describes its somewhat raggedy appearance. Lightly butter a baking pan. Bunch up the smaller pieces of the phyllo and lay in the pan. Save larger pieces for the top. It isn't important how the phyllo looks or which way it's placed in the pan. Just make sure the bottom of the pan is covered. 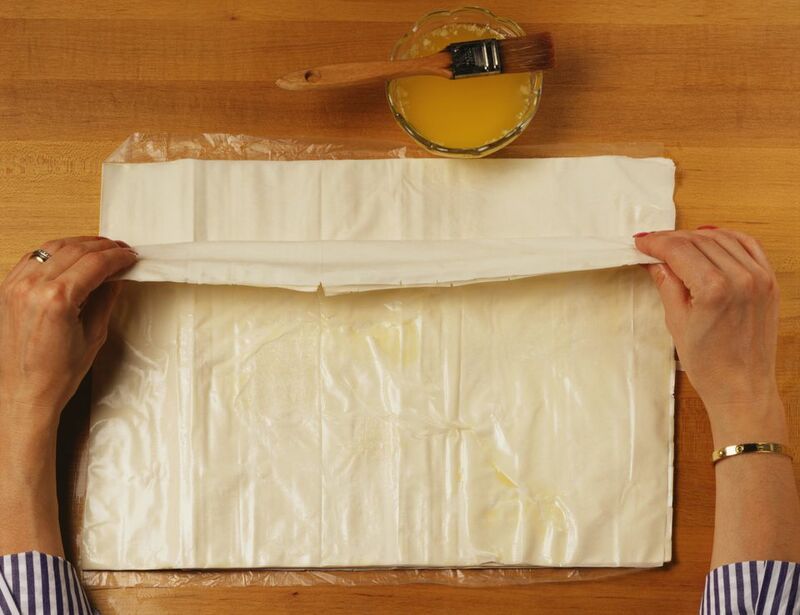 Continue adding pieces of phyllo—bunching the larger pieces, and laying the smaller pieces on as well—until reaching the equivalent of at least three layers of phyllo. Drop cheese filling by the teaspoonful on top, spaced out as needed. Use the largest pieces of phyllo for the top, creating the equivalent of at least three layers. If only one large piece remains, place smaller pieces first, and use the largest piece(s) as the top layer. Brush top lightly with butter. Score the top (do not cut through to the bottom) into pieces and bake at 350 F/175 C on the rack just below the middle of the oven for 30 minutes or until golden brown. This cheese pie is very light and very flaky—and because phyllo can be very forgiving, chances are that no one will know the phyllo sheets weren't perfect! Note: This cheese pie can be made this way intentionally, using bunched up sheets of phyllo as shown, only with full sheets instead of broken pieces. 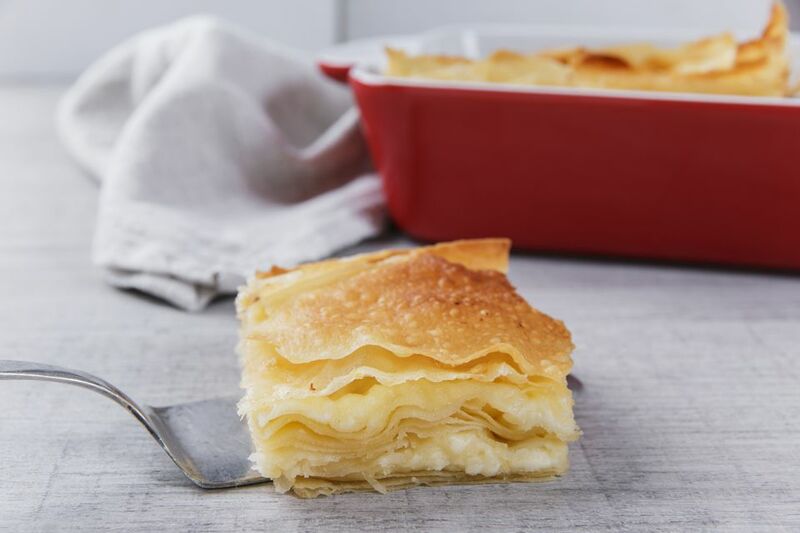 Try it also with more than one layer; for example, 3 layers of bunched phyllo on the bottom, cheese, 1 to 3 layers of bunched phyllo in the middle, cheese, top layers.